Hitentaisei Rikon was born in Hi-ken (Pei xian). 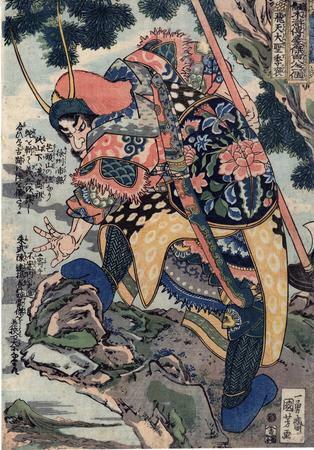 He was an expert in the use of the marutate (a round shield that had twenty-four knives attached to it), while he usually carried a spear in his left hand and a knife in his right hand, though Kuniyoshi does not depict him thus. He was a brigand on Bōtō-zan (Mangtou shan) famous as the site where the great general Ryuhō raised his army, killing many poisonous snakes. Here Rikon placed his army for a battle against Kyūmonryū Shishin (Shi Jin), Shinkigunshi Shubu (Zhu Wu), Chōkanko Chintatsu (Chen Da) and Hakukada Yōshun (Yang Chun), also heroes included in the Suikoden. "Hitentaisei Rikon and Happinata Kojū... are the second-in-command of a robber gang on the Mountain of wild grass and stones (J. Bōtōzan) under the lead of Konseimaō Hanzui... who possesses magical powers. Rikon carries a great round shield to which are attached twenty-four knives and he is also armed with a magic dagger. The three robber leaders believe they would be able to quickly eliminate the Ryōsanpaku brigands but the magical powers of Nyūunryū Kōshonshō... surpass those of Hanzui. In chapter 59 Rikon and Kōju finally side with Ryōsanpaku and join the legion. Hanzui follows suit. In this print Rikon is on look-out from a promontory and inspects the valley below. Although not specifically mentioned in chapter 59 of the Shuihu zhuan, he is most likely on the Mountain of wild grass and stones watching the Ryōsanpaku bandits who have pitched camp at the foot of the mountain. The robber captain does not carry is usual weapons here; Kuniyoshi shows him instead with an axe on a long pole and a sword." Quoted from: Of Brigands and Bravery: Kuniyoshi's Heroes of the Suikoden by Inge Klompmakers, p. 122.